Michael Barin began his career at the impressionable age of thirteen, when he began an apprenticeship with jewelry designers in Los Angeles, California. He spent years learning his craft and perfecting his technique, until he was ready to create and design his own unique line of fine jewelry. Michael is involved in all aspects of the creation of his pieces, creating a seamless experience from conception to the final product. His inspiration comes from the art of the pharaohs and the jeweled treasures of kings and queens. Influenced by current fashion trends and popular culture, his jewelry resonates with a classic beauty that is timeless. Michael uses only the finest stones in colors that are on the cutting edge of style, incorporating both modern diamonds and precious natural diamonds of ancient times. 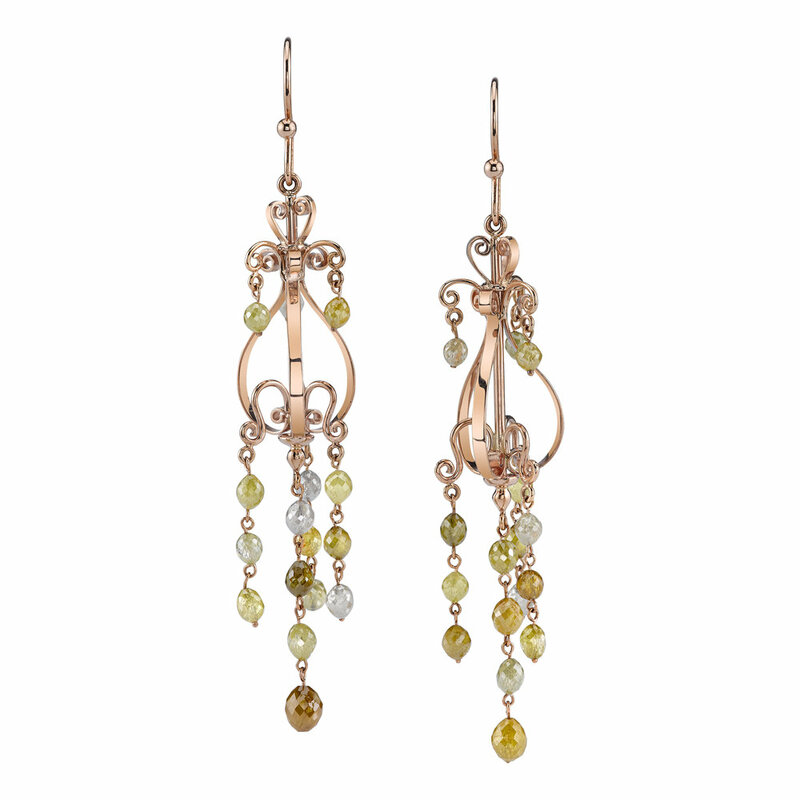 Rustic Diamonds Briolette CHANDELIER earrings set in 18 Karat Rose Gold. His jewelry appeals to the fashion-conscious woman who is concerned with excellence and wants her jewelry to be both sensual and practical. Michael’s jewelry collection is merely a continuation of his artistic expression, his personal vision of beauty. All of the Michael Barin pieces displayed on this site and Sixth Avenue Fine Jewelers boutique in Carmel-by-the-Sea are hand-fabricated and can be customized according to personal tastes. Special orders are welcome - we can create pieces using your personal center stones.